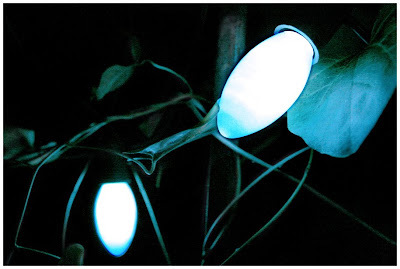 Because I am too lazy today, but maybe not really too lazy, though I am still in my pj bottoms after 5 pm, I am using an old image, one from last Christmas of Katie's blue lights, but the lights are still up and I am thinking of last Christmas anyway, so I think it's okay. I have taken no pictures, my camera still asleep where I laid it a few days ago, all unposted images snug in my computer at work, but just a few moments ago the sun touched the lower branches of the hackberry tree in the front yard and I just had to share it with you - there are no leaves left, at least no green leaves; there are a few tiny tiny brown ones still hanging, and the sun lit them up like Christmas lights, and for just a minute or so it was a glimmering golden thing of beauty, and then the sun moved on; sunset can't be too far away. Yesterday the wind was up and all the leaves were dancing on the tree branches, I remember noticing that last year, but today the wind is gone and nothing is moving except the sun, we are almost to the solstice, tomorrow night is it?, and then the movement to longer days at last. From here on the couch, I look down Mary's driveway and Charlie the cat is curled next to some azalea bushes, near the front porch, and Lyndi-Linda has tied a big red bow around the branch of the Japanese maple; it hangs in my sight over the old green lawn chairs in front of the green house, all red and green over there, all quite Christmasy with nothing more than that bow, Mary's old bow, I remember it atop a tree or two, never a Christmas tree, she just used one of the tall plants in the house, or a potted tree. I shopped yesterday and it felt odd not buying anything for her, felt strange not having anyone for whom an amaryllis was a piece of heaven, at the candy store I was drawn to the lemon peel dark chocolate thingies and the lime truffles but didn't buy any, still thinking of Mary, and I didn't look for a cat ornament or a silly card. I can't even remember what I bought her last year, don't have a clue, but I can still see the presents wrapped and scattered on the floor around the "tree", still remember going over Christmas morning and watching her unwrap things. Night is coming on now and Charlie is beginning to blend with the darkness, his white chest still visible, but the rest of him almost gone. Like this year, almost gone, almost over, this long, long year, this year of no energy proving to be a blessing today when I recalled I still had in my Jeep a small feathery white Christmas tree, one I'd loaned to the lovely, lovely Katie last December for just one night for open house at her business, just a piece of decoration, she's laughed at me more than once for lugging all that stuff around still, but today, like I said, it proved to be a blessing, and is now sitting in a garden urn on the green table by the glass doors, no lights or anything, but I am going to light a candle or two next to it and it will be perfect. Ben Hur is on tv, the sound is off - my usual m.o., Maggie has crawled into my lap, purring, not yet asleep and night has fallen. Charlie is hidden by the darkness, the red bow has disappeared. your blog is so truly a journal. it brings me right into the room with you. i remember when mary passed away, it was the very first time i had read your blog. When I eat at a Chinese restaurant, the best part of the meal is the fortune cookie. When it's a really good fortune, I stick it straight into my purse. When it's a bland one, or one I just don't happen to like, I put it in the rejection bowl. Since 2009 was a total wedgie of a year, I have already put it in the rejection bowl. Maybe that's why this Christmas has been a little like looking at the holiday backwards through a mirror. I can clearly see the tree and the presents and the Christmas quilt on the back of the chair even though my own head is blocking part of the view. It's like when you talk into the mirror at the person behind you cutting your hair. If you do it long enough, it almost seems normal. But not quite. This is the first year in a long time that I haven't spent with a certain guy. So that great book, that silly golf towel, that beeswax candle with the negative ions, that sweet tea in the box with the chrysanthemums on it at the Chinese market - these will all stay on the shelves for someone else's holiday this year. I'm busy. I'm taking the 2009 rejection bowl and emptying it out. No more sadness. No more tears. No more turning into a solid block of grief. I'm still looking backwards a bit, but now I know that something great is springing up just out of sight behind my big old head. I miss Mary with you and I don't even know her, but I felt your loss today. What marvellous writing that we can be with you and see and feel what you do. I truly hope Christmas day is a blessing for you. As we each miss Mary right along with you, I am reminded again of how blessed you were to have had her in your life. How beautiful was the friendship you shared. How wonderful that you made her live, also, for us. I love your slow thoughtful approach to Christmas. It seemed so peaceful for you, and simple, and perhaps a little sad as you thought of Mary.